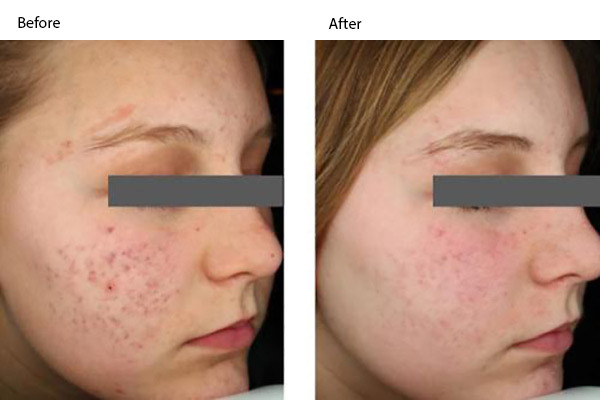 What is the CUTERA® Laser Genesis Treatment for Acne? The CUTERA® Laser Genesis Treatment is a non-ablative laser treatment for acne scars and any redness left behind after old acne clears. With its unique 1064nm short-pulsed laser, CUTERA® Laser Genesis won’t break the barrier of your skin while drastically decreasing the size of any enlarged pore or acne scars. By promoting collagen production at the cellular level, CUTERA® Laser Genesis helps you soften the most common forms of acne scars. How Does the CUTERA® Laser Genesis Work? CUTERA® Laser Genesis improves acne scarring in two ways. First, the laser collapses superficial blood vessels on your skin to minimize the redness surrounding your old acne lesions. Next, it promotes the production of healthy collagen at the cellular level to diminish acne scars and improve texture. CUTERA® Laser Genesis works because it penetrates deep into your skin’s cellular layer to counter your overactive sebaceous glands–where most acne problems arise. Q: How long does one CUTERA® Laser Genesis treatment take? A: Depending on the area being treated, one CUTERA® Laser Genesis treatment requires anywhere between 30 to 45 minutes. Q: What does a CUTERA® Laser Genesis treatment feel like? A: The treatment can be best described as feeling like a warming of the skin, much like how the sun heats your skin on a hot summer day at the beach. Q: Will I need any downtime after a CUTERA® Laser Genesis treatment? A: There is no need for downtime following a CUTERA® Laser Genesis treatment. While you may experience some mild redness shortly after treatment, it is only for a few hours so there is no need to avoid work or cancel any social plans. Q: What parts of my body can the CUTERA® Laser Genesis treat? A: Most Midtown Med Spa patients use CUTERA® Laser Genesis to treat the face, chest, neck and hands. A: CUTERA® Laser Genesis is a multiple treatment solution. Most Midtown Med Spa patients begin to see a noticeable difference in skin texture after just four treatments.